The first successfully mass-produced molded plastic chairs, these were molded in fiberglass reinforced polyester and designed by Charles Eames (1907-1978) in 1948. They were introduced in 1951 by the Herman Miller Furniture Company and were produced in a variety of individual variations through 1995. This DAR (dining and desk chair) model illustrated has a lightweight structural wire base, often called the "Eiffel Tower". The RAR version had birch wood rockers on the bottom. Other standard models (DAX, LAX and SAX) had more traditional bent metal legs, some with swivel seats. 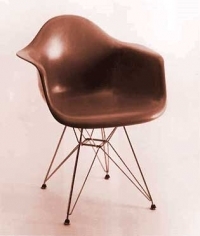 This design was originated by Eames in a similar organically-shaped one-piece stamped metal bucket seat in his winning design in the Museum of Modern Art's international competition for Low Cost Furniture Design in 1948. The competition was in collaboration with furniture retailers like Herman Miller, who agreed to produce the winning designs commercially. In 1946, Eames' original molded plywood chairs had been made by Evans Products Company and distributed by Herman Miller. In 1947 George Nelson (1908-1986) bought the tooling for Herman Miller, which then continued production until 1957. In 1994, they were re-introduced. A companion line series of upholstered wire mesh chairs designed by Eames was also introduced by Herman Miller in 1951. Intended to reduce weight, the seats were formed from welded wire mesh shells, carefully shaped to conform to body contours. This shell supported separately added resilient cushion pads, either in one or two pieces, and in a variety of colors. Like the fiberglass line, they also came in six different bases including "Eiffel Tower" legs (DKR), standard legs (DKW), or rocker legs (RKR). The wire mesh shell seat concept was further developed dramatically in Diamond chairs (later known as Bertoia chairs) designed by Harry Bertoia (1915-1978) and introduced by Knoll in 1952 in both low and high-back models. Bertoia, a sculptor and furniture designer who was at Cranbrook with Eames and had worked with Eames on chairs.